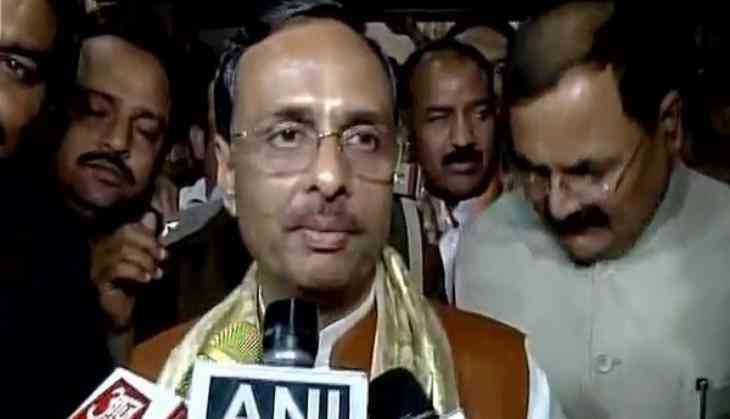 Uttar Pradesh Deputy Chief Minister Dinesh Sharma on Friday was announced as the leader of the legislative council of the state assembly. Sharma, earlier was serving as the mayor of Lucknow, but resigned the post after becoming the Deputy Chief Minister. He has been given the ministries of Higher and Secondary Education, Science and Technology, Electronics and IT departments. Sharma began his political career with the student wing of the Rashtriya Swayamsevak Sangh (RSS), the Akhil Bharatiya Vidyarthi Parishad (ABVP). Sharma was elected as Mayor of Lucknow in 2006. The minister was then named the state President of the BJP's Bharatiya Janata Yuva Morcha (Youth Wing). Following his contribution to the party's victory in the 2014 Lok Sabha elections, Sharma became the National Vice President of the BJP. He took oath as the Deputy Chief Minister in March 2017, following the saffron party's enormous win in the Uttar PRadesh Assembly elections. BJP had bagged 312 seats, and its allies 13, taking the alliance's tally to 325 in the 403-member Assembly.